Is there a point where the taxes and fees levied upon an industry become so expensive, so high, so onerous, that the producers decide to just stop? In last week’s post about ExxonMobil’s 2013 earnings, I noted that we earned about 5.5 cents for every gallon of gasoline and other petroleum products we refined, shipped, and sold in the United States. Consider this: The federal and state and local governments collected 40 to 60 cents per gallon in taxes. The American Petroleum Institute just updated their map showing the combined local, state and federal tax rate in each state as of Jan. 1, when new taxes took effect. The federal gasoline tax is the same from coast-to-coast –18.4 cents a gallon – which means any variations have been implemented by state and local governments. The highest gasoline tax in the country is in California, where it now exceeds 70 cents a gallon. Combined with California-specific fuel-blending regulations that drive up refining costs, these taxes help make Golden State gasoline prices the most expensive in the country. Several other states, such as New York, Connecticut, and Hawaii, are close to California in terms of the fuel-tax burden their residents bear, though none has yet joined in crossing the 70-cent-per-gallon threshold. I encourage you to study API’s map (click the graphic above to enlarge), or dig into its interactive version for state-and-local-level specifics. I do not have stock in ExxonMobil and am not employed by them. At what point does a tax become unjust, even though legal? Some of you may even argue this tax is “fair”. I have explained in the past with my post Fair? Is fair really fair that “fair” does not equal “just and right”, or “equitable”. Please ponder and consider for yourself. Would taxes be “just” or “right” or “equitable” if you were required to pay 3 & one-half (3.5) times to sixteen (16) times more in taxes than your “take-home” earnings for the authorization to produce and sell your product? May God bless and keep safe, America. February 24, 2014 in Economy/Economics, Energy and Transportation, Human Nature, Liberty, Logic and Reasoning, Philosophy and Reason, Taxes, Tyranny. ← Daddy, how was I born? 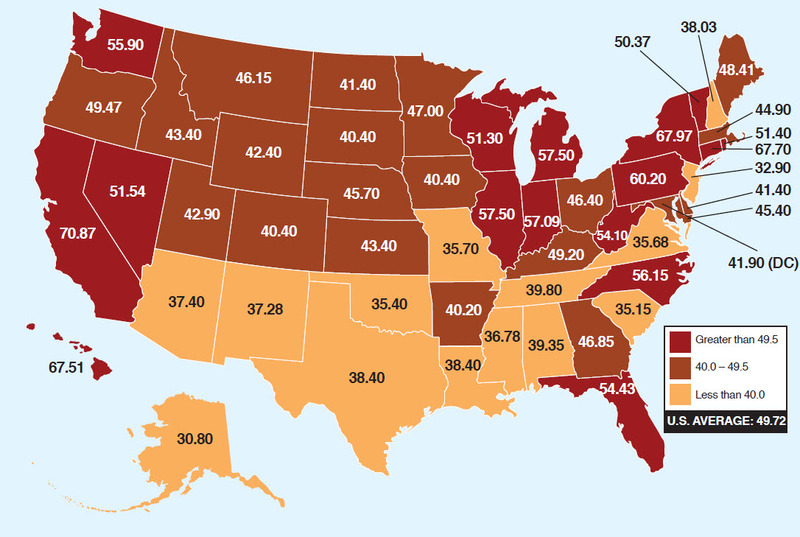 What I noticed from this map is that New Jersey has lower fuel taxes than South Carolina. I wouldn’t mind the tax so much if it actually fixed the roads. But I think some portion of the taxes goes into state general funds instead of strictly for road improvements.